Do you love bringing a fresh cut Christmas tree into your home every year, but dread the thought of cleaning up the trail of needles and sap it leaves behind? Don’t despair! Before trading in the real thing for a tree-in-a-box, there are steps you can take to make the process of bringing a tree into your home and cleaning up in the aftermath a lot easier. 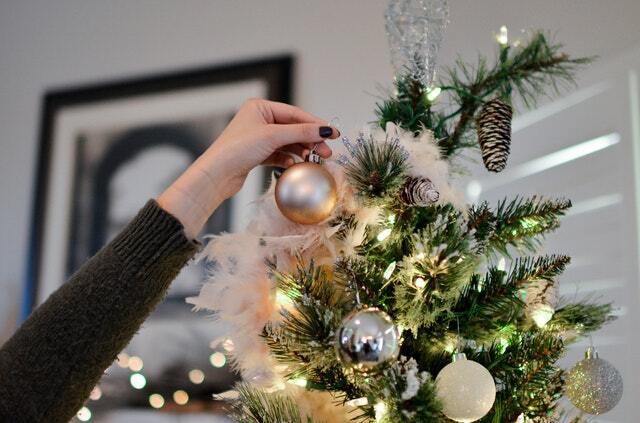 • Shake the tree or tap it on the ground to remove loose needles and any debris that settled among the branches. • Make sure that the tree fits into the tree stand. If it doesn’t fit, now is the time to shave down the trunk and cut off the lowest hanging branches. Then secure the tree in the stand leaving the mess outside. • Clear a pathway to where you want to set the tree and cover the carpet or hardwood to catch any needles or sap. • Place a rubber mat or tray underneath the stand to catch any spills or leaks when adding water to the tree stand. • Also, after the tree is in place, add water to the stand and cover it with a tree skirt. This will help to prevent needles, drops of water, and sap from getting on the floor or carpet. • Lay plastic or old bedsheets on the floor around the tree to catch needles and dripping water before removing it from the tree stand. If the tree stand is full of water remove some of it before lifting the tree out. Tip…using a turkey baster is a good way to do this. • Place the tree directly onto the plastic or bedsheet and carry or slide it out the door for disposal. Even after taking all these precautions, there will most likely be stray needles and spots of sticky sap left behind. • Pine Needles – Sweep or vacuum often so fewer needles get embedded in the carpet or transported to other areas of the house. Unfortunately, these can easily get caught in carpet fibers so it’s best to use a rubber-bristled broom to free them. • Tree Sap – This can be very difficult to remove, but with the right methods and some patience, you can be successful. 1. Ice – Ice the spots and then when the sap hardens, pick it out of the fibers or off of the floor. 2. Rubbing Alcohol – This acts as a drying agent. First, soak a cloth or paper towel with rubbing alcohol, blot it into the stain and allow to dry. Then pick the sap out of the fibers. 3. Dishwashing Liquid – Apply a small amount to sap and gently massage with a warm damp cloth, working it into the fibers. After the sap is loosened and removed, make sure to rinse and blot up all of the detergent. When your DIY methods don’t work or if you would rather leave carpet and floor cleaning to the experts, call Purity Cleaning and Restoration Services at (406) 642-3545 or visit us online for details about our carpet, hardwood floor, and area rug cleaning services.